Anya Kamenetz is an education correspondent for NPR. She joined NPR in 2014, working as part of a new initiative to coordinate on-air and online coverage of learning. Kamenetz is the author of several books. Her latest is The Art of Screen Time: How Your Family Can Balance Digital Media and Real Life (PublicAffairs, 2018). Her previous books were Generation Debt; DIY U: Edupunks, Edupreneurs, and the Coming Transformation of Higher Education; and The Test. 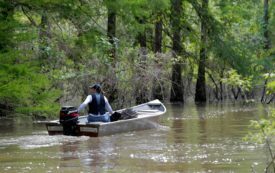 Time is running out for the Louisiana water protectors, but they’re not giving up. Freelancers staged a walkout at Viacom this week, instigating one of the most unlikely and successful labor campaigns in recent memory. Thousands of students came together to infuse the largest citizen conference ever to address climate change with energy, enthusiasm and a new vision for the future. The Congressional overhaul of federal student aid is a good first step, but true reform of the system will require an effort on the scale of the GI Bill. There may be an overlooked Dean legacy brewing.